My good friend Natalie got me a subscription to Cooking Light magazine last month. I will admit, I was not into cooking magazines before, however since I have branched out my cooking lately, I love this magazine now! I made 2 recipes from the March Issue - and both of them were a hit. I have yet to make the 3rd one next week still, but I wanted to share them with you. Oh and a big pre-requisite with me is it has to be EASY. These 3 are easy. I promise. And very yummy! Enjoy !! This came out just fabulous! Click Here for the printable recipe. For anyone that loves Italian meat sauce, try this. You won't be disappointed! I make my own sauce (without meat) normally and I have to say this is just as good! Not sure if the embedding code is working, so if you can't see it below, then click on the link for the recipe. The second recipe is Broiled Tenderloin Steaks with Ginger-Hoisin Glaze. This was fast. It took me 30 minutes from prep to plate. Just pay attention to the broil times. Follow it to a Tee - I let it go 1 minute past and I feel the steaks were slightly overdone for my liking. Other than that, they were just delish!! By the way, I did not know what Hoisin sauce was until a month ago. Coincidently enough, I had 3 recipes that called for it this month. Weird huh?! You buy it in the Asian grocery section of your foodstore. I think I paid under $2 for it. The third one is Easy Braised Brisket - I did not make this. Yet. I plan on making this next week & will report back. It sounds really good!! Here is my friend Natalie that gave me the magazine. Kudos to Nat for my most favorite magazine ever - Cooking Light! And even better, it's not a Baby magazine! LOL. Mmmm...these look yummy...and I LOVE easy/short cooking time! 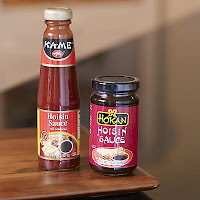 I've never used Hoisin Sauce before...looks like it'll be on my next shopping list!